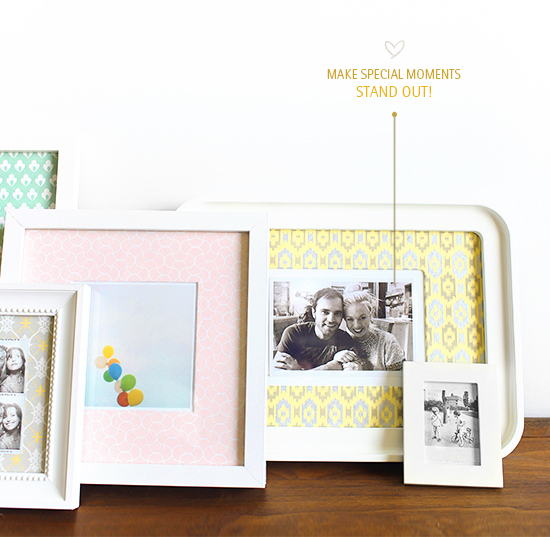 today we are adding a little interest to those white frames you have in your home. 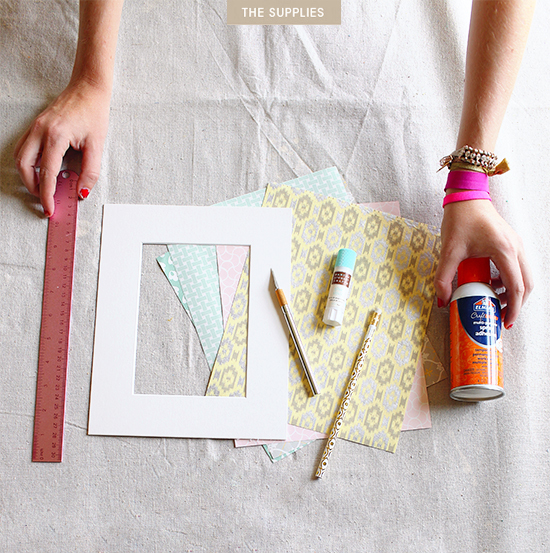 we ended up using some beautiful patterned paper from our favorite LA paper shop urbanic! this would be a thoughtful gift for a friend, or your mom, or anybody really! follow these steps (and the animation) to make it yourself! • cut paper 2 inches larger than you mat in each direction, thereby giving yourself an inch border around each side of your mat.- draw a line with pencil along the length and width of your paper so that you have a guide for gluing. • spray front of mat with spray adhesive and lay face down of the reverse side of your paper, taking care to line it up along your pencil marks. • trim outside corners at a 45 degree angles. • cut the inside of the paper from the mat, giving yourself 1/2 inch of paper along the inside and then cut the corners on a 45 degree angle as well. • fold the paper around the edges, taking care to smooth paper along the inside beveled edge. • secure flaps with a glue stick. just like mixing patterns in fashion it works the same way for these frames. oh, and you have to check out this video my boyfriend made for my pal emily henderson on mixing the patterns on your sofa! it’s seriously helpful. 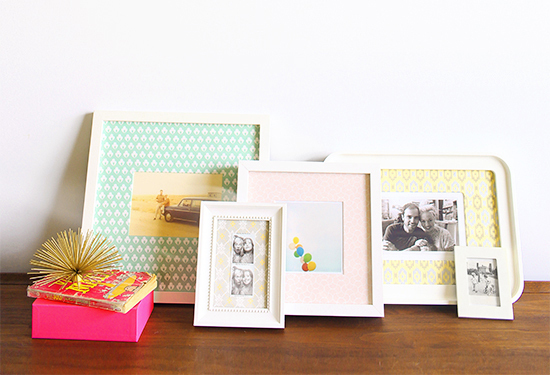 go on now, spice up those frames! Absolutely stunning! I’m a graphic designer from Cape Town and I come onto your blog every morning for a bit of inspiration Bri! Thank you so much for posting such wonderful things! love, love this idea, creative and easy to do! That is really a cute idea! And love the paper choice, it looks stunning. Thanks for sharing the idea! Have a beautiful weekend. Love this idea! This is one of the first DIYs I’ve ever seen on a blog where I thought, “Ok, I could actually do that.” (I am NOT crafty at all, clearly.) Gonna try it this weekend! I adore this idea! 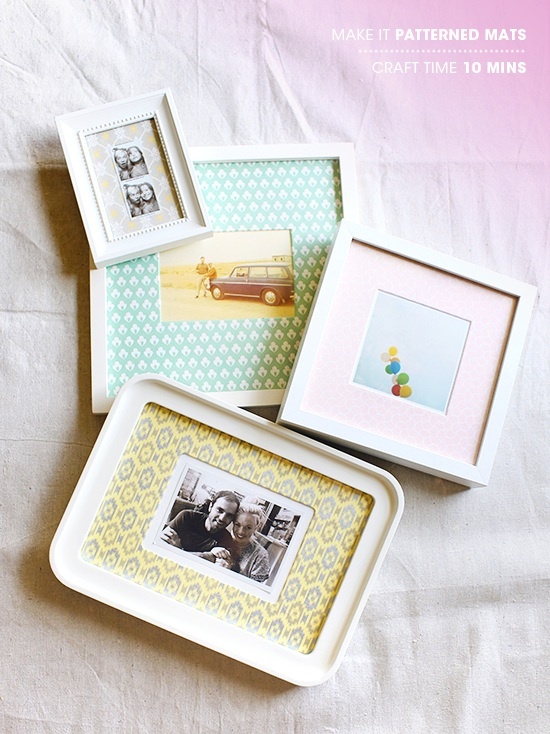 All of my frames are from Ikea and I find that their mats are extremely yellow – I will definitely be doing something like this! Loveeedddddddd It! I will definitely do it! Seriously…you ALWAYS have the cutest posts! You have have such a creative/wonderful eye! i love this! have tried to do this before but never thought to make the small cuts and fold the inside square… which makes it so much easier and will let it lay perfectly smooth! genius! thanks for sharing. Ah I love this! I totally need some funky patterned mats! Wow this is a great idea!! also very cute and stylish! Great post! it’s a cool way to add color pops to a room, also. Such a lovely idea! I like how the colorful background adds joyfulness and fun to regular-sized photos. I am loving the DIY right now too! This is a great one! I adore this post! But where do you find such great frames? I’m having the hardest time finding some that are moderately priced! I really love this idea. I’m an artist and framer and spend all day telling people how to frame their favorite photos and art. I love this idea as a way to spice up a classic white frame/white mat combination. I will be sharing this great idea on my art and framing blog, Naked Art. Thanks for the inspiration!